Perfectil Protan has been developed to provide specially selected micronutrients to nourish from the inside. 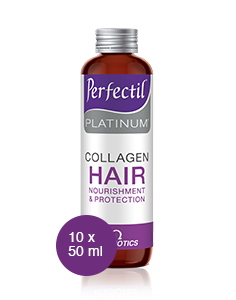 With specific vitamins and minerals to support the building blocks of your skin's lower dermal layer, hair follicles and nails, for normal health and appearance. Perfectil Protan also provides 1000mcg of Copper which contributes to normal skin pigmentation. 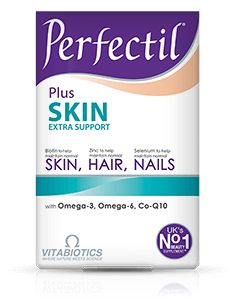 Perfectil Protan is recommended for use by both men and women of all ages to help maintain skin, hair and nail health. 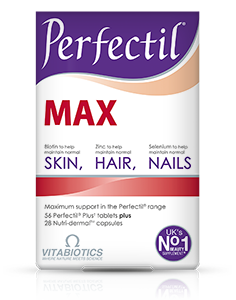 Perfectil Protan replaces your daily multivitamin and mineral supplement, and can be used for as long as required. No. Perfectil Protan does not provide a UV protection factor. It is therefore important to use a suitable sun tan lotion. Generally, Perfectil Protan may be used along-side medications because it contains only moderate levels of vitamins and minerals, and it is free of any drugs or hormones. For specific advice on taking Perfectil Protan with medicines, we recommend that you contact your doctor or pharmacist first. 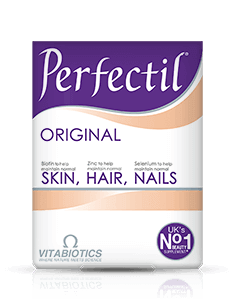 Perfectil Protan is available in 60 tablets, it is recommended to take 2 tablets per day (1 month's supply). Two tablets per day is recommended with your main meal. Swallow with water or a cold drink. Taking the tablets with a large meal maximises the absorption of the nutrients. Perfectil Protan should only be taken on a full stomach. Always ensure that Perfectil Protan is taken with plenty of liquid to wash the tablet down, and not tea or coffee as this may cause the tablet to disintegrate too early. Perfectil Protan has no known side effects when taken as directed. Do not exceed the recommended tablet intake. In case of overdose, seek medical advice immediately. 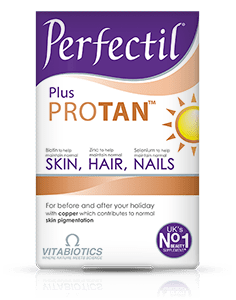 Results vary amongst individuals, but in most cases we would expect the beneficial effects of the vitamins and minerals in Perfectil Protan to build over several weeks, with noticeable results in one to three months. A regular intake is recommended. 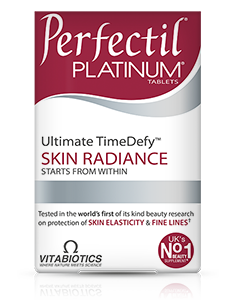 There is no maximum length of time over which Perfectil Protan may be used.